This bumper is in conjunction with the grille. The stock air duct in the bumper reinforcement will still be functional with the C-West bumper. Also, air intake duct on the upper part of the grille remain the same from EVO 7, 8, and 9 to get fresh air into the air cleaner. Made from PFRP. Canards sold seperately. Pliable Fiber Reinforced Plastic (PFRP): This material has similar properties to those of FRP, but is a lot more flexible. 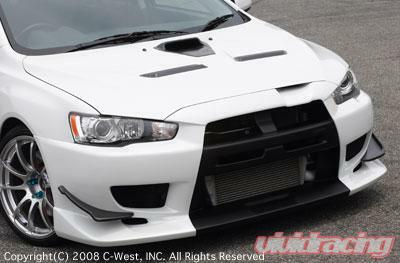 The front bumper made with PFRP is much more difficult to crack due to its flexibility. Depending upon the paint, PFRP aero-parts are much easier to repair, even with damage received while the vehicle is in motion.